This is an absolutely extraordinary and extremely rare Knoll & Pregizer paste floral art deco fully articulated jardinière lapel brooch c. 1925. Marked 935 KP. Looks exactly like platinum, diamonds, and gemstones. Punctuated with faux ruby & sapphire cabochon flowers and beads, navette shaped faceted glass faux emeralds and faux citrine and amethyst navette bezel set pastes dangling from the surmount. All of the white pastes are hand bead and bezel set in a millegrain mounting. 4" long by 2" wide. This is the type of KP that was sold in only the finest of stores. I've never seen another one. It's an almost exact copy of a precious jeweled lapel watch by Lacloche Frères of Paris in the 1920s. 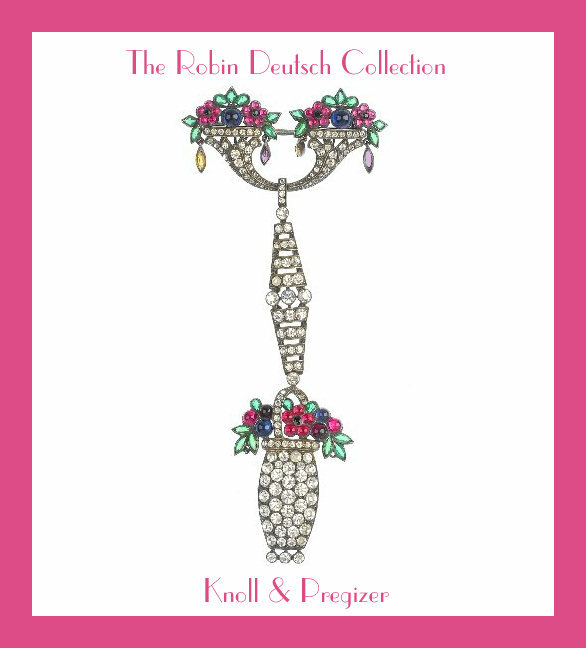 They were one of the finest jewelry maisons during the art deco era and another example of the incredible imitations of fine jewelry Knoll & Pregizer produced at the height of their artistry.